World Cup 2018 is still months away. A lot can change in five months, but Gareth Southgate has to start looking now at who he should take to Russia in June. The 2017-18 Premier League season has seen the rise of players like Jesse Lingard, Harry Maguire and even the resurgence of Ashley Young, but also this season has seen the fall of many players who were so crucial in helping The Three Lions secure a place in Russia such as Adam Lallana, Danny Rose and Joe Hart. With this, Gareth Southgate has a selection headache ahead of the tournament as he looks to find a balance between in-form stars and players with massive reputations who on their day, we all know can still be brilliant. This is who The Mastermind believes England should take to the World Cup this summer. Enjoy! After the season he had in Sunderland and this solid season he’s having so far at Everton, Jordan Pickford has to be England’s number one choice this summer. Joe Hart has been caught off-guard far too many times for West Ham this season, while Pickford has hardly ever put a foot wrong. Pickford has claimed 100% of the crosses he’s come for this season and has made 3.00 saves per game at Everton so far this season, keeping 6 clean sheets. He’s been injured all season long so it may be a bit unfair for him to just walk right into the team, but on the basis of his performances last season, Tom Heaton should be a definite pick for Gareth Southgate at World Cup 2018 if he’s fit in time. If he’s not fit in time, Nick Pope can take his place just as the goalkeeper has done excellently well all season long for Burnley. Joe Hart has not had a good season at West Ham so far by any means and was dropped in place of Adrian pretty early on into the season. However, he still has 75 England caps to his name and will bring a lot of much-needed experience between the posts should he earn Southgate’s selection. In terms of ability, Joe Hart is probably still England’s best goalkeeper. He just might not be able to show his full ability after sitting on the bench the entire season. Although aging and certainly past his best days, Gary Cahill is still England’s most experienced and commanding centre back. He’s not the most pacey, but centre forwards around the world must fear Gary Cahill when they see him bulldozing toward them. Every single aspect of his game other than pace is well accomplished and the leadership he brings to England will be key at this summer’s World Cup. Who has been Manchester United’s best centre back this season? Not Chris Smalling. But who has been Manchester United’s most consistent central defender since Sir Alex Ferguson left the club. Undoubtedly, Chris Smalling. The 28-year old is a beast in the air and has the defensive awareness to match some of the best centre-backs in the world. On his day he can be absolutely brilliant and impossible to beat, which is why Gareth Southgate has to put full trust that he can partner Cahill this summer. Since moving to Manchester City, Kyle Walker’s game has taken off even more and he’s developed into the most self-assured and consistent right back in the league. With 5 assists in 25 Premier League matches, Walker’s been instrumental to the illustrious achievements of Pep Guardiola’s side this season and will be essential if England are going to have a good run at World Cup 2018. With the season that Danny Rose is having, Ryan Bertrand could easily end up being England’s starting left-back at World Cup 2018. Bertrand has been phenomenal for Southampton this season, even despite the club’s failure to grind out enough victories. The 28-year old is so much more mature than he was even just a few years ago and offers a threat in both attack and defense. With Steven Davis out injured for the Saints, the left-back has also taken on the role of captain for Mauricio Pellegrino’s side, showing his leadership and loyalty to Southampton F.C. At this point, it would be ludicrous for Southgate to select any other left-back over him for his squad this summer. Few defenders have been better than Leicester City’s Harry Maguire this season. Is that enough to propel him all the way to the top of the list of players Southgate should start every match? Probably not. But Maguire will undoubtedly be a useful weapon for Southgate to have in his locker and speaking of locks, he’s probably a nailed on pick for this summer’s 23-man squad should he stay fit. His physicality and strength is unrivaled by almost anyone else in the league and his aerial ability is just phenomenal, scoring 2 goals with 4 assists in 27 Premier League matches so far this season. If Southgate chooses to go with a three-man defense at this summer’s tournament, expect Harry Maguire to see a lot of playing time. Every single season it seems journalists and pundits around the world speak the words “This is the season John Stones becomes one of the best centre backs in all of Europe”. It’s 2018 now and it just hasn’t happened. Speaking honestly, with Aymeric Laporte at Manchester City now, Stones isn’t even close to being one of City’s top central defenders and should probably be fourth in the pecking order. However, he offers something different with his on-the-ball presence and passing ability and could still be of great use to England. The problem will only arise if Southgate overuses him. If Southgate can wisely pick and choose which games to play John Stones in, the 23-year old should prove to be a very effective option at the back for The Three Lions. Although a risky pick due to his injury woes, Phil Jones has the ability to be better than anyone mentioned so far in this article. The problem is, he can’t be at that level consistently enough, especially because he can’t help but get himself injured. Jones puts his heart and soul into every match he plays in and has been one of United’s top performers this season, featuring in 21 Premier League matches. If he’s fit come June, Southgate would be foolish not to take him to Russia. It was just last year when everyone thought Danny Rose would kick on and become one of the best left-backs in the world. Instead, since getting injured toward the tail end of last season, he’s actually gone downhill and has recently lost his place in Spurs’ starting 11 to Welshman Ben Davies. Fortunately for Rose, everyone knows his quality. His ability in both attack and defense will never be questioned and at 27-years old, his career is far from finished. With that in mind, the left-back should be a guaranteed pick but not a guaranteed starter at this summer’s World Cup. If England have Jones, Smalling, Stones and Cahill (in addition to Eric Dier), do they really need another centre back? Probably not. Perhaps this pick would be more useful going to a fringe fullback like Luke Shaw or Kieran Trippier. However, Michael Keane, being only 25 still, could really use the experience of what a World Cup has to offer as after the likes of Cahill and Smalling have retired, he is going to be needed to step up in their place. The Everton defender was exceptional for Sean Dyche’s Burnley last season and if he had been playing to the same quality for the Toffees in 2017-18 he would be a Harry Maguire-esque lock for Russia 2018. Unfortunately, he hasn’t been up to the same high standard he set for himself in 2016-17 and could be on the verge of missing out if Southgate decides to go with another fullback instead. It hasn’t been Eric Dier’s best season, but the same can be said for many Tottenham Hotspur players and he’s still the best defensive midfield option that England have to offer. Eric Dier was one of Hodgson’s best players at Euro 2016 and playing alongside his teammates like Dele Alli and Harry Kane, he should be able to flourish again for England at World Cup 2018. Still only 24, Dier does have the potential to be a future Xabi Alonso, he just hasn’t reached that level yet. Maybe the World Cup will be his opportunity to show what he’s made of. Like Eric Dier, Dele Alli is probably in the midst of his worst season at Tottenham since arriving at the club. That’s not to say he’s played badly, but he hasn’t been his usual high-scoring, lung-bursting self and his tally 5 goals and 7 assists in 26 matches is modest by his high standards. However, Alli is still undoubtedly England’s best midfielder and even despite being 21-years old is going to need to be one of the country’s top performers in Russia if they are going to have any chance at lifting the trophy. Jesse Lingard has been super successful this season and has been one of Manchester United’s best players. With 12 goals in all competitions, the 25-year old is even the club’s second highest scorer behind Romelu Lukaku. With a mix of technical ability and pace and power, Jesse Lingard brings a lot to any team and is one of the most versatile players that England have to offer this summer. Liverpool captain Jordan Henderson has the ability to be one of the most commanding defensive midfielders in the world. Unfortunately, he doesn’t show that promise on a consistent enough basis. A wonderful player with quality in nearly every aspect of the game, Henderson struggles from not being particularly special at any one aspect of the game. He’s a great passer, good in the tackle, can score and assist goals and is solid at holding the game up in front of the back four, but he’s not amazing at any of those things. Nonetheless, few others can offer England what Jordan Henderson can and the Liverpool man will likely be Southgate’s first choice captain. 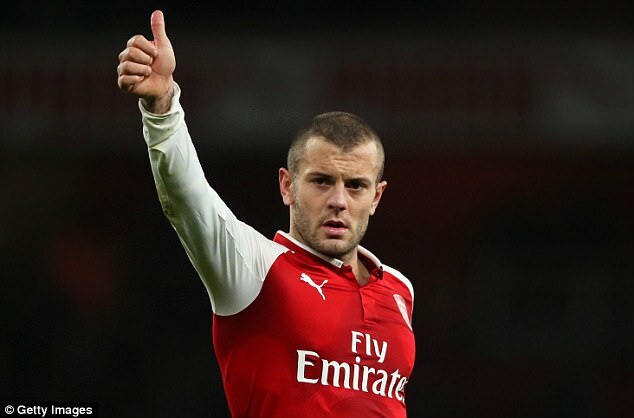 Jack Wilshere has never been closer to making a return to England’s squad than he is right now. The 26-year old midfielder has been Arsenal’s ace at times this season and although he’s only made 15 appearances so far this season for the Gunners, we are finally seeing signs that Jack is back to his best again. When it comes down to it, he’ll be fighting for a place against ex-Arsenal midfielder Alex Oxlade-Chamberlain, Chelsea outcast Ross Barkley, and Southgate’s one true love Jake Livermore. With those odds, Jack Wilshere might just be Southgate’s surprise selection at this year’s tournament. Adam Lallana was one of England and Liverpool’s best players in 2016-17 and he was instrumental in securing their place in the World Cup and UEFA Champions League respectively. This season, he’s been virtually non-existent and has been forced to bide his time from the bench in place of players like Emre Can and further forward the illustrious Mohamed Salah. Lallana has tremendous quality and can occupy a number of different positions but without any regular playing time this season he might not be his freshest self in Russia this summer. A favourite of Gareth Southgate, Alex Oxlade-Chamberlain can play as wing-back, winger, or in central/defensive midfield. The former Arsenal man hasn’t really taken off since arriving at Liverpool but he’s played enough games to probably still be considered one of England’s top players. There’s almost no scenario where the 24-year old misses out on World Cup 2018 in Russia. That being said, if he is picked, he will be one of the last that Southgate gives the call to, even despite how much faith he’s showed in the speedy midfielder in the past. England have not had a better player than Harry Kane since Wayne Rooney. The Tottenham striker has become one of the best footballers in the world in recent times and recently became Spurs’ all-time top scorer at the age of 24. He’s more mature than any other 24-year old England have ever had and could even be Southgate’s captain in Russia this summer. With 23 goals in 26 Premier League appearances this season, Harry Kane has been absolutely unstoppable and is likely going to be England’s savior this summer. Raheem Sterling is one of the Premier League’s most improved players and standout stars of 2017-18. He’s not even technically a striker, but that hasn’t stopped the 23-year old from finding the back of the net 15 times in only 25 Premier League matches this season. With his form at the moment, Sterling will be vital to England’s success this summer and a partnership with Harry Kane could be the mouthwatering duo England have been searching to find for years. Jamie Vardy cannot stop breaking records. More importantly, he will seemingly never stop scoring goals. For a country that has always had trouble scoring goals at big tournaments, Vardy could be invaluable for The Three Lions in Russia this summer. Gareth Southgate has to find a way to play the Leicester City man as much as he can, even if it means playing him alongside Harry Kane which could detract away from Kane’s ability to run the show. The 31-year old has bagged 15 goals in 30 matches in all competitions so far and if he can find the back of the net that often in June, England will be destined to go far. Marcus Rashford has been undervalued a lot at Manchester United this season. This really should have been the year that the 20-year old striker became a regular starter under Mourinho but it hasn’t exactly worked out that way and now with Alexis Sanchez in the squad, Rashford looks set to get even less playing time. But regardless of his playing time this season, Marcus Rashford still offers so much power and verve up front and can play as a winger or centre forward, something England are going to really value this summer. So there it is, The Mastermind’s picks for who Gareth Southgate and England should take to World Cup 2018 in Russia. Who do you think should make the squad? Comment below and be sure to find The Mastermind on Twitter for more World Cup 2018 coverage. See you soon. Next postIs Paul Abrahamian The Best Player to Never Win Big Brother?